In a word, “stickiness”. Visitors to a website are likely to spend more time on a site with video than a site without video. In fact, the time spent with video is more than double the time spent without, which results in a greater influence over buying decisions. According to Internet Retailer, “Visitors who view videos are 85% more likely to buy than visitors who do not”. That is an astonishing difference and a very compelling reason to make the time and financial investment into adding online video to your website. Another reason for the need of website videos is the amount of help they provide for search engine ranking. Videos are given priority over pictures, text, and audio files resulting in a higher SEO performance. Forrester Research reports that websites that contain videos are 53 times more likely to have an organic page 1 ranking than a site not containing videos. Knowing the importance of SEO, taking advantage of on-site videos should rank at the top of any SEO performance plan. Knowing that Google owns YouTube cements the case for video marketing within every website. Not too long ago, videos were basically used for only DIY and How To websites. Now, marketers understanding the results derived from these inexpensive blips of information, use videos for presenting every type of product or service. One only needs to perform a search on any topic in YouTube to find a vast array of videos on any particular subject. When performing an identical search on Google, these same nuggets of information are listed in importance on the resulting search pages. 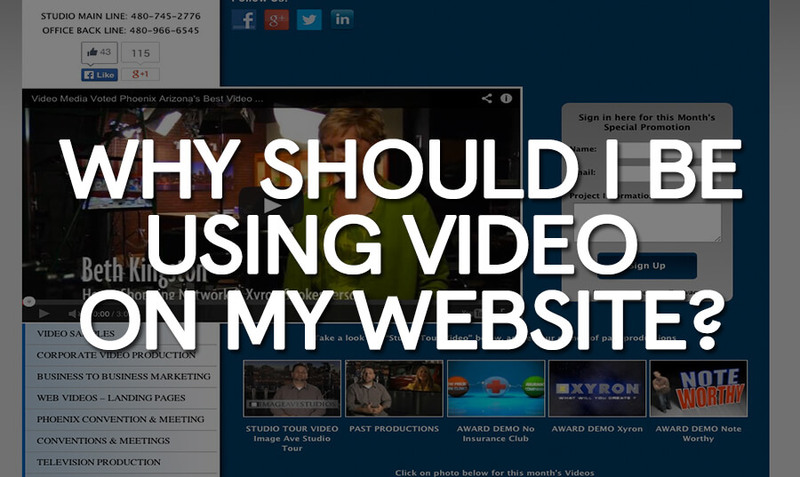 It only makes complete sense to embed informative web videos on every page of the retail site and every page of the service site. For service businesses, the online video enables the visitor an opportunity to meet the business professional and respond in a positive way to the audio-visual presentation. The video also allows the business professional to form an instant relationship with the viewer. That first impression will go a long way in helping to turn that prospect into a customer. Your website visitors will feel more connected to the buying experience just by putting a face with the “cart”. In some cases, videos have been known to go “viral” in a short time resulting in overnight success for the product or service. Videos are also important for the customer service experience. Having a video of a customer service representative explain “how to” issues for receiving excellent customer service will go a long way in maintaining the customer base. Most negative customer service issues arise out of a customer not taking the time to read through the FAQ’s found on almost every site. The difference of having a smiling face explain these FAQ’s rather than having to read them will go a long way in helping that customer resolve any issue with clarity and understanding thus allowing a better chance for repeat business. To effectively make the point regarding video marketing one only needs to review case studies that are available for the top online retailers. One in particular that really sets the record straight is the online shoe retailer, Zappos. Those who congregate in SEO circles are fully aware of the Zappos case study since it was one of the first made available to the public. – Over 77,000 website visits each month are attributed to Zappos’ video listings in search engines. Currently there are over 30,000 Zappos videos indexed in Google, although this number will fluctuate. Word has it that Zappos plans to increase that number this year to more than 50,000. The company reports in no uncertain terms that products with video support outsell those without video support. Now, knowing the results that web video production will provide, anyone in the retail product or service business will simply be left far behind if video marketing is not embraced by the company. Consumers certainly appear to want video and will spend more of their hard-earned dollars with e-retailers that provide this technology. The bottom line is that video will get you better rankings, which translates into more traffic, which ultimately converts into more sales. If you are an online retailer and haven’t embraced this technology, do it now! Article by Joe Forte, co-owner and producer at D-Mak Productions based in Phoenix Arizona. D-Mak Productions specializes in providing professional video production services to a wide range of industries and professions.